I often come across interesting pieces when I'm trawling through the Family History records.I wish I'd saved the wit who put his mutt on the 1911 census - occupation "watch dog" - but sadly, I don't remember where I found it. So from now on, I'll put my genealogy oddities in here so that I can share them with you. These three New Zealanders were living in London. Both Robert Hope and his niece, Florence Goodman, were dental surgeons, which is quite interesting in its own right... 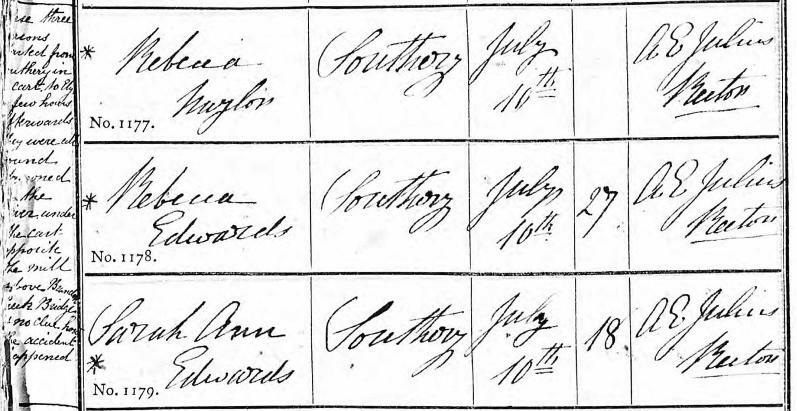 However, it was Dorothea Hope who got my attention by writing "I demand the right to a political vote" across her census entry. Good for her! A family tragedy recorded in Attleborough Parish Register in 1806: "Samuel Alden a married man aged 40 years was buried in this Church-yard July 23rd, who was murdered by his wife Martha Alden on Sunday July the 19th & for which horrid Crime she was executed on the Castle Hill Norwich on Friday the 31st of July". From Quaker burial records: "Jonathan Corbyn of Allburgh dyed the 27th 6th month 1701 And was buried att the end of his gardin the 30th which was According to his desire"
I wonder if the present occupants know he's there? In a similar vein... "Will Barber of Gissinge departed this life the 9th of the 11th month 81 & was buried in his owne Orchard bye his wife the 13th of the same month whose wife was buried the 27th of the first month 1686"
The curate of Southery in Norfolk noted this in 1839: "This poor old man was run over at night, near his own house, by a cart containing two grand-daughters. He lingered three weeks." This local tragedy of 1868 is a real mystery: "These three persons started from Southery in a cart to Ely. A few hours afterwards they were all found drowned in the river under the cart opposite the mill above Brandon Bridge and no clue how the accident happened." Aha! I've found it! Head: James Ange Little, journalist: "Incidentally, we have an Airedale Terrier. I do not know whether particulars are required, but in case you want them, here they are!" Name: Roger, Relationship to Head of Family: ? Age: 5, Marital Status: ? Children born alive: ? but something over 100, Occupation: watchdog, Industry or service: Looking after the house, on own account, at home + outside, Birthplace: Keighley, Yorkshire.